You have great knowledge, I’m building charging lights with High Power LED, I was using charging circuit but now its almost finished in market and hard to find, (Actually it was very cheep and tiny for a single Li-ion battery) So I decided to design workable charging circuit by my own. Please tell me if your said circuit will work for maximum 4 Li-ion batteries, if not so what component should I replace…..
which Transistor have been used in the circuit? Yes ! It can charge a Laptop’s 18650 Li-Ion batteries perfectly ! For a 2600mAh battery, the charging current should be below 1Amp. ,, ,, 3.68v wit bat. First of all, I’m not the designer of this circuit. So I can’t help you about trouble shooting of this circuit. Long time ago I’ve built this circuit on breadboard, and it just worked, never checked the voltage. For balanced charging, I’d recommend you to use readily available TP4056 based 1A Li-Ion charger modules. If you’re looking for even more simpler way to charge the battery, just put a 1N4007 diode in series with the battery and a 5V 500mA(max limit) power source. This will charge the battery to approx 4.25V at 5-6 hour. Increase the current to 700mA, that will charge the battery within 4 hours. And from my experience, it’s safe, I’ve replaced AA batteries from all of my torches with old laptop batteries, and they’re charged with a single 1N4007 diode, runnning over an year without problem. As I said it before, I know nothing about the working of this circuit, sorry about that, and the original creator no longer maintains this site. Nigeria .sir hop the Batt did not overcharge and even when it exceed d the time. as d diode regulate d cct n protect .am confused. sir did u apply any rule to get it or is it try n error for( 700ma.) and hw can I get archive that 700 bcos I never come across such xformer. common type r 300 500 1A 1.5A 2a. I hv 500 n 1A. how Cn I reduce d current only.? thanks fr d idea. what u said I should do is too simple. just a diode 5volt n 500 current..sir what is ur transformer o/p reading. (no load.) I think diode allow current n volt flow I one direction. I’m not using a transformer, just an old mobile charger. 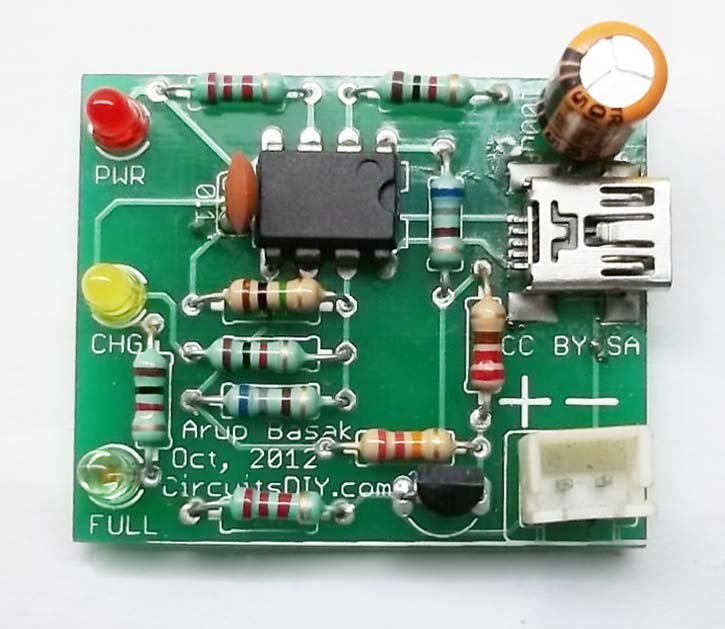 You can reduce the current simply by using a 1 Ohm 1/2 watt resistor in series with the diode, but there will be loss of power, so it’s better not to use it. And please don’t call me “Sir”, there’s no need of that, I’ll be happy if I could happy you in future, stay connected. am to do what u hv said and I ll gv u d feedback .when our light stage a bit..thanks a lot. charging li ion battery one or more cells with ic 8205 & IC DW01A & 100ohm&1k 104pf.which i find as d most simple/cheap/easy way to charge it more properly with d use of d smal panel built already on every cellphone battery. *note* if u want to charge more than one cell .then connect them all in parallel. i used switch in d process. 16.03.2018 I have ordered and payed a PCB for USB Li-Ion Charger but up to date nothing received nor any message.Could you help me ?